You can also start an application using the Launchpad feature that is new for Mac OS X Lion. This is often faster than using the Applications folder as described in the previous section, particularly for applications that do not have a Dock icon. Launchpad is designed to mimic the Home screens of the iPhone, iPad, and iPhone touch. So if you own one or more of these devices, then you are already familiar with how Launchpad works. If the application you want to start resides in a different Launchpad screen, click the dot that corresponds to the screen. Launchpad switches to the screen and displays the applications. If the application you want to start resides within a folder, click the folder. Click the icon of the application you want to start. Mac OS X starts the application. The dots that represent each Launchpad screen are quite small, making them hard to click with the mouse, but there’s an easier way to navigate the Launchpad screens. 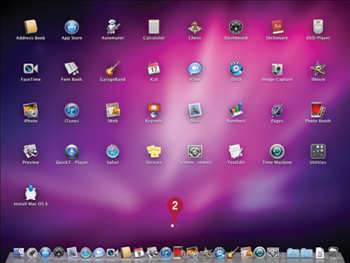 Mac OS X Lion has designed Launchpad to look somewhat similar to the Home screens of the iPhone, iPad, and iPhone touch. Another similarity is how you navigate the screens. On an iPhone, iPad, and iPhone touch, you navigate the Home screens by using a finger to swipe the screen right or left. With your Mac, you can also navigate the Launchpad screens by swiping. In this case, however, you must use two fingers, and you swipe right or left on either the trackpad or the surface of a Magic Mouse. Note, too, that you can also use a trackpad gesture to open Launchpad: Place four fingers lightly on the trackpad and pinch them together.